Starting the day by reading the Morning Call is key to your investing success! The Morning Call’s Technical Indicators section explains and graphically shows the daily activity of our five SmarTrend proprietary market indicators. Experience demonstrates that when these indicators reach extremes (overbought or oversold) they can be expected to reverse direction. When such a reversal occurs in all or most of the five indicators on or about the same time, a change in the general market direction is also highly probable. 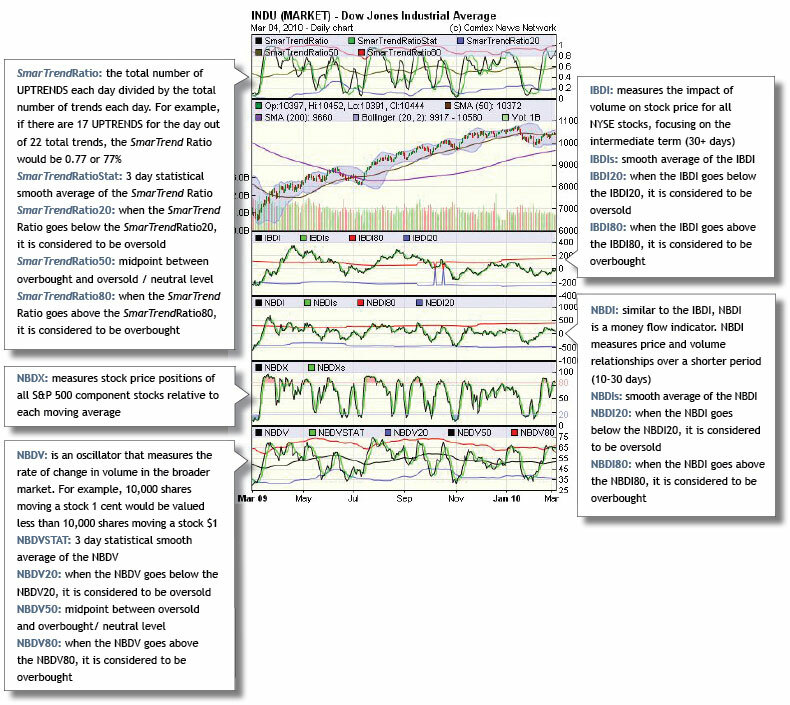 Near-term market moves are measured to identify the best possible returns for traders/investors. Daily price/volume examinations are among the key data upon which to base such forecasts. In this report, intraday indicators are examined to improve the timing for the expected trade-term and near-term move which, in turn, can help determine if UPTRENDS or DOWNTRENDS will outperform in any given time period. • UPTREND: an indication of the upward direction of a stock based upon SmarTrend’s proprietary pattern recognition system. SmarTrend subscribers are alerted to all UPTRENDS and DOWNTRENDS as soon as they are generated by the system. • DOWNTREND: an indication of the downward direction of a stock based upon SmarTrend’s proprietary pattern recognition system. SmarTrend subscribers are alerted to all UPTRENDS and DOWNTRENDS as soon as they are generated by the system. • SmarTrendRatio: the ratio of SmarTrend UPTRENDS to DOWNTRENDS. For example, if there were 17 UPTRENDS issued for the day and 5 DOWNTRENDS issued, the trend ratio would be 3.4:1.